Fundraiser by Bella Vista Historical Society Arkansas : "Operation Cabin Fever Phase 2 - Restoration!" "Operation Cabin Fever Phase 2 - Restoration!" Hi Everyone! Sorry it's taken a year to give you all an update, but until just a few short days ago, there's not been much to update you about. Conflicts in timing, the weather, as well as other factors, have kept this little log cabin in the hills of the Ozarks right where it was discovered when we first began Operation Cabin Fever just a bit over a year ago. Now, however, all that has changed! The History Museum is proud to announce that, in the last week, thanks to the effort of a lot of people, the little log cabin was carefully, oh so carefully, extracted from it's hilly hidden location and now has a forever home next to the Bella Vista History Museum! Though we are thrilled to have the cabin firmly on its new foundation, this is only the beginning! It is going to need a lot of TLC to bring it back to its former self. There is damage to some of the logs on the back of the cabin that will need professional restoration. The badly deteriorated roof is in dire need of replacing, as is the missing front porch. The museum also plans on furnishing the cabin with period pieces so visiting children (as well as adults) can easily step back in time and do more than imagine what it was like living as many of the early settlers to NWA lived. Any donation to further this project forward will be greatly appreciated, truly! It's also not too late to get your name on a plaque that will be placed inside in this charming cabin by donating 100.00, or more, to the cause. If you work or belong to a club, you might suggest that they donate as an organization for a chance to be on the plaque! 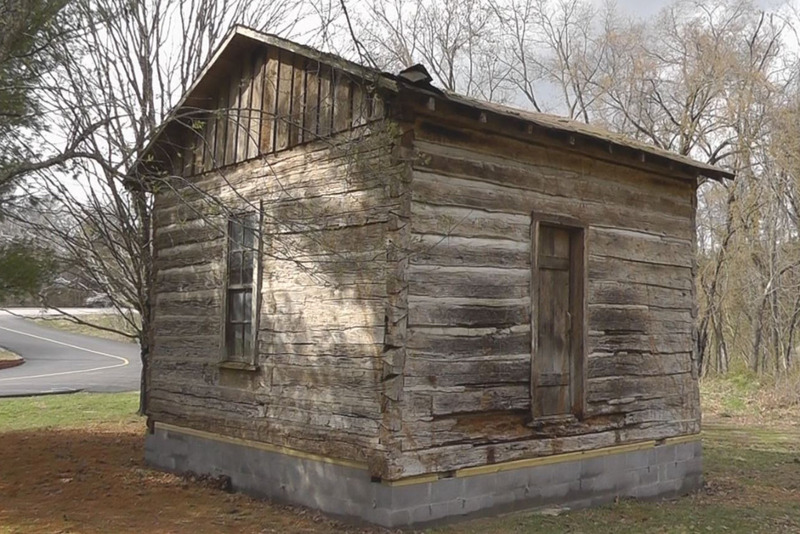 The Bella Vista Historical Museum in Bella Vista, Arkansas, has received an old pioneer cabin (the actual cabin in the photo above, which was reconfigured in 1974 from the original cabin built in the early 1900s) donated by an local resident. It currently resides on an Ozark hillside behind a private residence. It is our goal to give it a forever home in a prominent position on the grounds of the Bella Vista History Museum. As a nonprofit 501c3 organization, run entirely by volunteers (no paid staff), the museum is hoping to enlist the help of the community, as well as anyone else who has a love of days gone by who'd like to help with this charming early pioneer cabin that is a cherished bit of Bella Vista history. Any donations will be welcome, with no donation too small. Every little bit can help make this little cabin a real addition to our historical museum. As further incentive, anyone who contributes at least $100, or more, will be acknowledged by having their names added to a memorial wooden plaque to be placed inside the cabin. If enough is made beyond the initial goal there is even the possibility that an old time well could be built from native stone, with an engraved donor's plaque embedded in the rock on the outside of the well. This old well could also double as a wishing well, where a penny tossed into the old time well bucket could buy a special wish (and help with yearly upkeep of the Cabin too). So please help the Bella Vista Historical Society with this charming cabin project. Join OPERATION CABIN FEVER by donating to the cause and sharing it with your friends and family, both on and off the net! Hello Everyone! We're sorry its taken a year to give you all an update, but until just a few short days ago, there's not been much to update you about. Conflicts in timing, the weather, and other factors, kept this little log cabin in the hills of the Ozarks, right where it was a year ago when we started this campaign. Now, however, all that has definitely changed! The History Museum is proud to announce that, in the last week, thanks to the effort of a lot of people, the little log cabin was carefully, oh so carefully, extracted from it's obscure location and delivered to it's forever home next to the Bella Vista History Museum! Any donation to further this project forward will be greatly appreciated, truly! It's also not too late to get your name on a plaque that will be placed inside in this charming cabin by donating 100.00, or more, during this campaign. If you work or belong to a club, you might suggest that they donate as an organization for a chance to be on the plaque! This cabin is a historical treasure that now belongs to all of us, so be sure to stop by and see it soon. Oh, and if you're driving by on the highway, though you may be tempted to look, for safety sake it's best to keep your eyes on the road! You can, however, turn onto Kingsland Rd, go through the American Legion parking lot, park in front of the History Museum, and STARE AWAY!